kaleidoscopic memories: music by beat furrer for double bass and electronics. first performance on june 8, 2016 in centre goerges pompidou (paris) by uli fussenegger. in kaleidoscopic memories for double bass and electronics, beat furrer explores with uli fussenegger the possibility of quick perspective changes for interpolating different sonorities together. in addition to the already rich colourful tone of the solo instrument, comes a pre-recorded and electronic processed shadow partner, in order (according to furrer) to reach other sonic spaces. a significant part of the production of the electronics consisted in exploring the reactions of the sound of the double bass to the acoustic spaces that surround it. 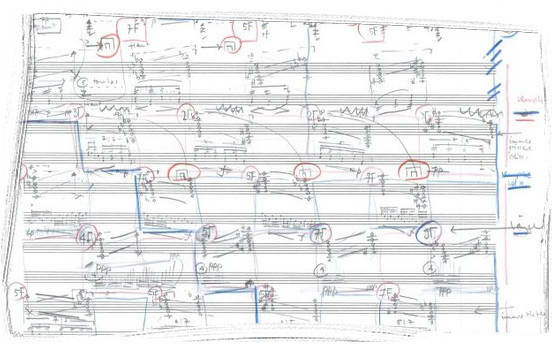 beat furrer, in his musical theater piece fama (2004-2005) was already interested to the various forms of sound propagation in space: without relying on electronics, he was amplifying some tone colour characteristics of the music instruments via wooden panels and other acoustically reflecting surfaces around the musicians. here the composer uses the computer to scatter the sound of the solist in small sonic fragments, which are then put together again according to another layout and, via accelerations, decelerations and reversals, assembled in a series of structured sonic events, until the process is being explored again in the reverse direction – as moiré perspective changes inside a kaleidoscope.